I’ve visited the Salvadoran village of El Mozote several times in the last few months. The journey never loses its impact. El Mozote is the site of one of the biggest massacres in Latin American history: this is the village where in 1981, an elite Salvadoran military unit, armed and trained by the United States, slaughtered 1,000 unarmed citizens, most of whom were children. Eighteen former military leaders accused of planning and ordering the massacre are finally on trial for the war crime in a small court in eastern El Salvador. Last month, I made the winding, bumpy trek from San Salvador to El Mozote once again, with the usual collection of Cristosal staff members and Salvadoran journalists. That day, we were headed to a judicial inspection of the massacre site. Dorila Marquez, a witness of the massacre and the current head of the Association for the Defense of Human Rights in El Mozote, was going to point out the exact places and sites she had mentioned in her court testimony. “¿Como se llama?” She was carrying a black plastic hairbrush, with which she gave her hair a few furious strokes. I told her my name, and she asked why I was there, eyeing the group of official-looking adults behind me. “We’re visiting for the day,” I said in my limited Spanish. Her little brother stood behind her, tossing pebbles into the street and squealing every time one landed near a passing car. By “the history,” she of course means the massacre. It’s a history that is inescapable in today’s El Mozote. Just from where we were standing, I could see La Casa de Memoria (the House of Memory), an informational sign recounting the details of the massacre, several brightly painted murals depicting families holding hands below the words “nunca mas” (never again), and the massacre memorial in the town plaza, just yards away. These are the signs of a town reclaimed by inhabitants who slowly returned to its dust and desolation after El Salvador’s civil finally ended in 1992, more than ten years after the massacre here. Sensing she was about to lose my attention, the girl sidled up next to me and loudly admired the pattern on my t-shirt. I smiled down at her. “Are you on your way to school?” I asked. “Sí,” she said. “We’re learning how to hear the word of God. And I’m learning how to play the guitar!” She launched into an exaggerated air-guitar sequence, and I laughed. Jealous of the attention his sister’s antics were getting, the little boy abandoned the pebbles and grabbed her hairbrush instead. He launched it surprisingly far, all the way into the bushes on the other side of the street. The girl yelled at him and he began to cry, with wailing, exaggerated sobs. She rolled her eyes and drew him close, patting his shoulders and making shushing noises. Watching them made me think about my own brother, and the way we spent our childhood fighting and making up and fighting again. I may have gotten annoyed with my brother, but I never had to be afraid that he would grow up to join a gang, or be forced to run for his life, or disappear and never come back. When I was nine, evil was a shadowy figure in a movie. Death was something that happened to old people. This kind of innocence was stolen from the kids of El Mozote in 1981. In fact, a peaceful childhood is still out of reach for many of today’s Salvadoran kids: out of the 675 people under the age of 25 facing or fleeing violence whom Cristosal has assisted over the last two years, 62% were under the age of 18. More than half (54.4%) were direct victims of violence like serious threats, sexual assault, and forced gang recruitment; in 2017, 38.5% of those direct victims were 11 years old or younger. The siblings I met in El Mozote that day served as a visceral reminder of how integrally connected the tragedies of El Salvador’s past are with its modern-day violence. A sacred trust between citizens and their government was broken during the 12-year civil war, where too many civilians were considered collateral damage. The government has yet to earn the confidence of its people. Impunity is rampant– 95 out of every 100 homicides remain unsolved in El Salvador, according to the Washington Office on Latin America. Most people don’t report crime to authorities, fearing such action will bring, at best, apathy, and at worst, violent reprisals. These fears are not unfounded; police have been known to advise families to take what they can carry and run instead of offering help, and there are reports of gangs infiltrating the police in some places. A fair trial in the El Mozote case is a promise for a better future for that curious and friendly girl and her little brother. It is a step toward rebuilding the trust that was lost, and with it, a future where children can live without fear. Before long, it was time for our group to leave the plaza. I said goodbye to the kids and climbed back into the van. We headed up the hill to the Casa Toriles, where Dorila was waiting. Dorila is a small woman with long dark hair. She sat on the porch of the house where, thirty years earlier, she watched government troops murder the previous generation of El Mozote’s children. Despite this grisly past, the house looked homey and inviting. A poster of Monsignor Oscar Romero was taped to the kitchen door behind Dorila. A pig snuffled in a pen nearby. Dorila’s face was grimly set in anticipation of the task before her. But relive it she did, walking us through her experience of the massacre: the window from which she first saw the soldiers coming, the hill behind which she hid with her young children, the field where she smelled the smoke of burning homes and clothes and bodies. The experience was clearly taxing. She was usually quick to smile, but today her face was drawn and her expression flat. She discreetly wiped away the tears that came to the corners of her eyes without stopping her narration. “It was so terrible. That’s why I have to keep telling the story, so things like this never happen again,” she said. The judge listened closely to everything she said, while his assistant recorded her words carefully in longhand script on a pad of paper. A photographer took pictures of the window, the hill, and the field. We had almost finished when the defense attorney, there to represent the former military leaders accused in the massacre, cleared his throat. Dorila explained again about the choking black smoke and the smell. “El Mozote was black all day,” she said. “The smell was very strange…it was like carne asada, but different, because the soldiers burned all their clothes and houses, too.” The judge moved on, trying to minimize the time Dorila had to spend in the painful details that were, after all, already recorded in her court testimony. But the defense attorney couldn’t let it go. “But how could the smoke have reached up here?” he asked again. The judge intervened, reminding the lawyer that Dorila had explained how houses were burning all around, not just in El Mozote. Smoke could have come from any number of directions. But it was too much for Dorila. For the first time, her composure broke. “He’s doubting me! If you were here that day, you would have no doubts,” she said angrily. “I feel your pain,” he started to say, trying to backtrack. “I’m sorry if I offended you,” said the defense lawyer. “If there’s one comedor (food stand) on the corner, you can smell it in the whole town,” snapped Dorila. “If they’re massacring and burning so many people, don’t tell me the smell doesn’t spread.” Overcome with emotion, she stood up and disappeared into the house. When she came back a moment later, her face was set. She answered the judge’s last few questions, and then she was finished. The journalists, many of whom knew Dorila from previous interviews or visits, said goodbye with the typical Salvadoran kiss on one cheek. They thanked her for sharing her painful story yet again. We left Dorila at her house and walked back down to the main plaza. The journalists interviewed one of the defense attorneys in front of the massacre memorial. I tried to listen in on the interview, but my attention kept drifting to the memorial. I had seen it before, but I still couldn’t help but stare. It’s a modest memorial in humble surroundings. 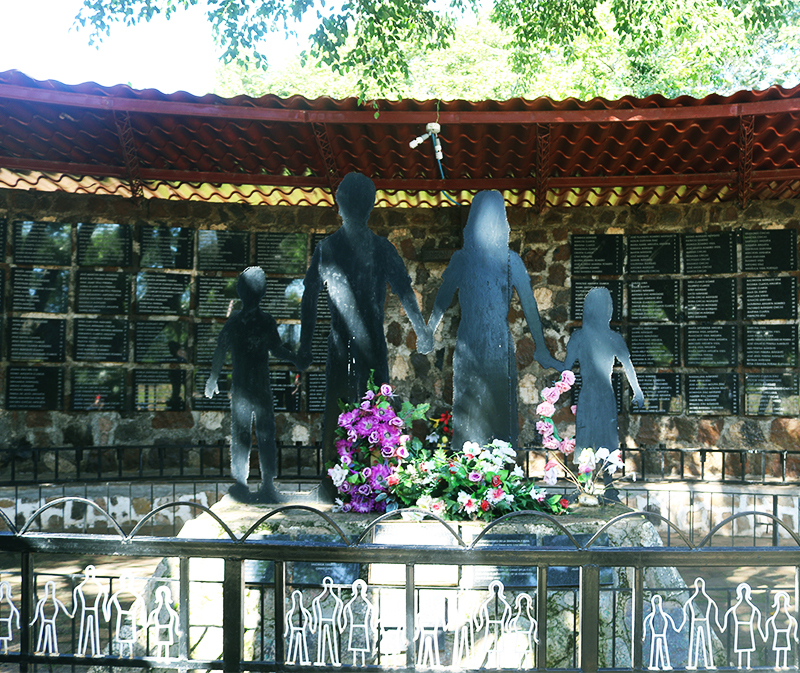 The names of the victims and their ages are etched into reflective black stone squares arranged in a grid behind a metal cutout of a family holding hands, wreathed in flowers. The whole thing is surrounded by a low white fence. It stands in the uneven stone plaza, where many of the victims were murdered. A dusty dirt road snakes behind it. It’s not as grand, as famous, or as well-visited as other monuments I’m familiar with: the sprawling World War II monument in Washington DC, for example, or even the simpler Vietnam wall. But there is an air of defiance to this memorial. It, like the massacre it commemorates, demands to be recognized. As my attention wandered from the interview, the names on the wall jumped out at me. These were the names, not of soldiers, but of mothers, children, grandfathers. I noticed Julia Del Cid, age 25— my age today, and Dorila’s age in 1981. There was María Marta Márquez Márquez, age 9. I thought about the little girl who had welcomed me to El Mozote just that morning. My eyes were pulled to five or six zeroes in a row: babies with names like Niña Claros Gómez or Niño Barrera Romero. By the time the memorial was built, there was no one left to remember these little ones’ first names. My heart ached. This list of names, and the magnitude of suffering they represented, was overwhelming. In that moment, it seemed impossible that I could take any meaningful action in the face of such an atrocity. Clearly, no one can undo the horrors that happened at El Mozote. But that doesn’t mean I should do nothing. 3. Restored confidence in El Salvador’s public institutions. Inside El Salvador, this trial has the power to deal a powerful blow to a centuries-long culture of impunity. The Salvadoran government estimates that 70% of victims of violence don’t report crimes to the authorities. It’s no wonder, when victims of forced displacement have told Cristosal things like, “There are gang members in the police, so it’s better not to file reports,” and “When we went to the police, they told us to keep our mouths closed for our own safety. What can we do? 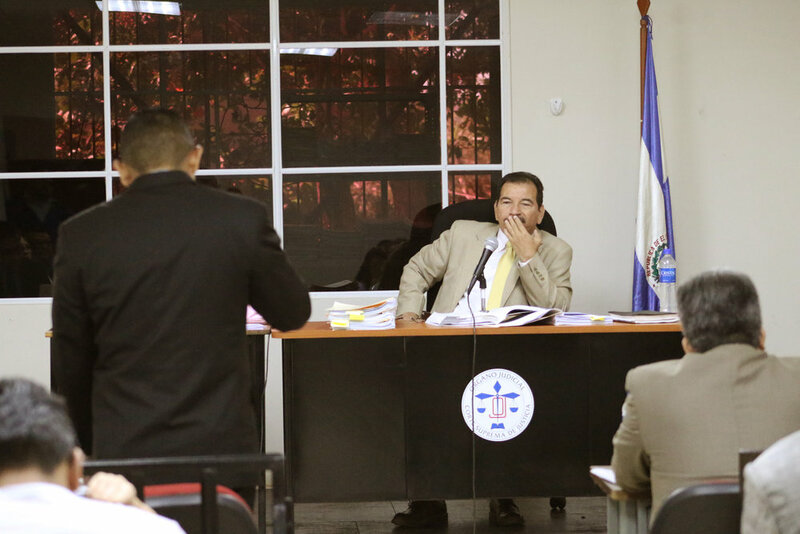 It’s better to run.” This trial is building capacity in the Salvadoran judicial system and showing the Salvadoran people that their justice system can function effectively. 4. El Salvador’s chance to set a human rights example on the world stage. You may have heard of war crimes, like those perpetrated in Rwanda or Yugoslavia, being tried in an international tribunal. The El Mozote case is being prosecuted in a small court in San Francisco Gotera, El Salvador. But that does not make it less noteworthy—on the contrary, a case only goes to an international court when a government is unwilling or unable to prosecute a war crime at home. This case can set an example for the domestic prosecution of war criminals in a time when children and civilians are still too often targets for strategic wartime gain. 5. Accountability in a crime that offends all of humanity. The El Mozote massacre is one of the biggest massacres in our hemisphere’s modern history. It’s recognized as one of the major unprosecuted war crimes in the world. A fair trial can send a message that even powerful people will be held accountable for their actions. Every time we hold perpetrators responsible, we refuse to accept the idea that crimes against humanity can be committed without repercussions.